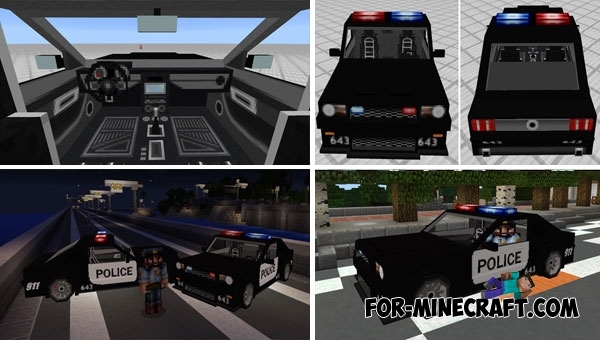 For the first time, you can become a real cop in Minecraft PE. By installing this addon, you get a real police car ready to fight crime. We also recommend to download the GTA Mod which contains popular gangs and police officers from GTA. Together with this addon you will have a chance to independently deal with crime and punish the bandits once and for all. The car has only one place for driver, but the developers are constantly modifying the system of add-ons and in the near future we will probably be able to put several players into the car. In addition to fast driving, the police car has a police flasher and siren sounds during the chase. Take the carrot on a stick to drive the car, and also do not forget that you have a trunk where you can put objects or police equipment. The car has a very strong resemblance to a real Ford Mustang which has a powerful engine under the hood. The Police Car addon is not the first sport car for MC:PE, here you can download other cars designed for a very fast ride. How to install the Police Car Addon? Ford Mustang addon (MCPE 1.0.0/1.0.4.1)It's time to change your car on red Ford Mustang with a white stripe..